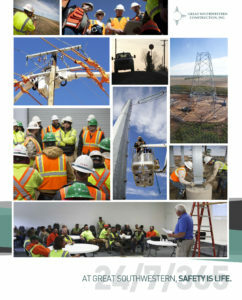 At Great Southwestern, safety sustains our employees, customers and company, and is a core value. Our culture embraces constant innovation and improvement in our safety practices as the catalyst that sets us apart today, tomorrow and beyond. For us, this is not an option; it’s a requirement to be the best in the industry. We strive to deliver the best safety training, tools, support and mentoring to each and every one of our employees. In turn, we expect and receive behavioral excellence and integrity that fuels the success and innovation that is necessary to remain an industry-leader in safety. Quality, honesty and accountability form the foundation of Great Southwestern’s safety culture. From entry level employees to our president, everyone is required to perform their jobs as safely as possible and maintain the highest levels of honesty and quality. The safety of our employees and the general public shall receive first consideration in the performance of all work because no job is done right unless it is done safely. You can’t put a price on the rewards you reap from strong safety performance: healthy employees, quality work and consistent value for our clients.